discussion on the best way to achieve world peace." inform, merely record. MARK "only half decent person there"
choose the wrong career. Go back to that rock and roll band. - Howcome, he's our CTO! I dunno, how come he's our CTO? - No, Howcome, he's our CTO! - yeh, some real sounds comin' at ya now. yeh! copyright issue! 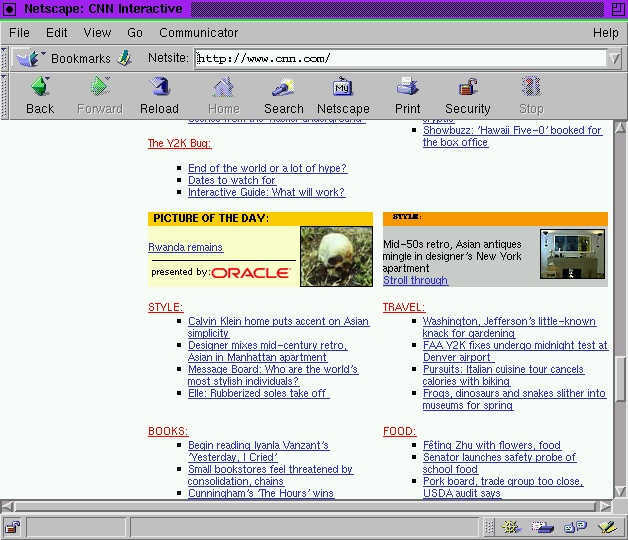 ), but Brit-based "contemporary NewzFeed"
Windows/ Linux rumble at Comdex Spring '99. - It's still called "disco dancing". Groovy! - delegates include top execs from "US Army"
- now that's what we call e-business interactivity! - but thanks for waking you up anyway. - there isn't a Telephone Misuse Act, is there? here's some rubbish Perl that will show your current BT bill. deter tribute bands - and is it like a Heinlein "S-group"
NESTLE MEGA TRUFFLE (UKP1), fair warning that the "sumptuous"
orange liqueur ice-cream "hidden inside" is evilly repellent. It is registered at the Post Office as "IPO won't change us"